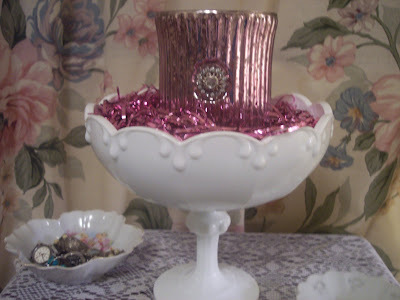 Join our lovely Hostess Beverly at "How Sweet the Sound" for other Pink Saturday posts! 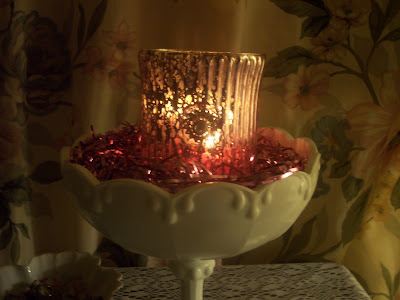 I really love to use my thrifty finds throughout my home. And I have a tendency not to use them for their intended purposes. A lot of my pretty dishes/bowls etc. end up in all the different rooms in our home. In our bedroom I have one of those floor jewelry boxes. I don't really use the top part that flips open to reveal a mirror. I keep seasonal jewelry in that part, so I don't get into it very often. So, this surface makes for a nice little vignette in our bedroom. And I change it up ALL the time. LOL For the month of February, to celebrate Valentine's Day, I decided I want a little something soft and romantic for this spot. 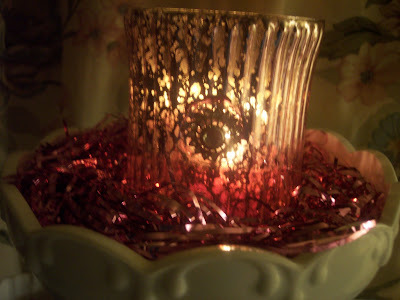 Of course, I wanted pink, candlelight and use what I have. Those were my 3 key points. This past summer we went camping in Ohio at Sauder Village. There was an antique Mall there. One of the vendors was selling off all her milk glass/white glass items. I bought a really nice assortment of pretty things. this was my most expensive piece I bought for a whopping .50 cents! It's a really nice large size compote. 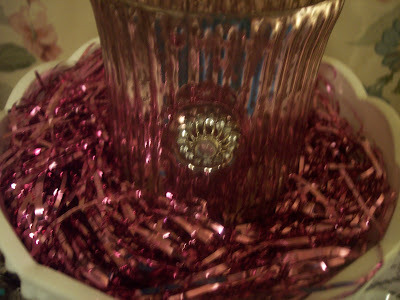 I used some shredded metallic pink paper and my $1.99 pink mercury glass candle holder. Super simple and very pretty. Diann, this is very pretty! You always find the neatest things at such great prices. 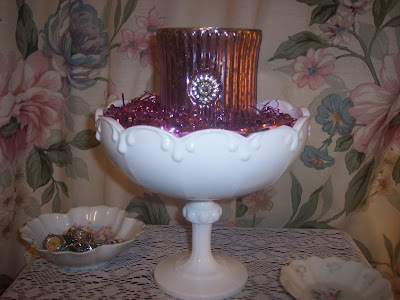 Pretty compote and candleholder, too. My mother had a collection of milk glass that one of my nieces now has. I always liked it. 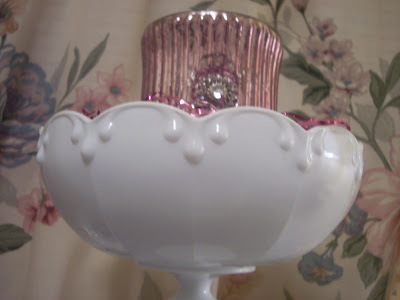 Your compote is lovely and the pink mercury glass is delightful! I love milk glass and have a collection of it. I think it looks wonderful with pink. Love how the candle makes it all glow!!! SO pretty! I love pink and really should start participating in this one. Love the mercury glass too! Fifty cents??? Really? I so wish I could go shopping with you! Thank you for stopping by and leaving your sweet comment. It is so nice to "meet" new people from all over the world like yourself. Oooooh, so charming and romantic! Ohh,it's so pretty. 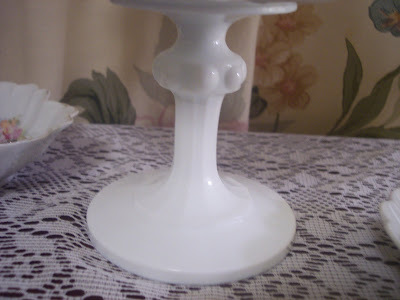 I love milk glass or any of the white glass. Thank you for your visit and your sweet comment..I just cringed when you said you bid on 4 books,I knew what was gonna happen. :). 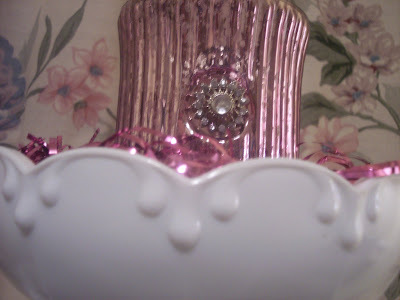 Happy Pink Saturday and have a wonderful weekend..I just love visiting your blog. Love the pinks!! Love milk glass! LOVE the shredded pink paper!! Where is that from? Diann... love your use of the pink grass! just perfect! I'm with you... I love a fantastic bargain!